Guess what? This beautiful Cavaliere Wall-Mounted Stainless Steel Range Hood is on sale! This entry was posted in Filters for Range Hoods, Home Improvement, Indoor Air Pollution, Kitchen Design, Kitchen Tech, Range Hoods, Wall Mount Range Hoods and tagged glass canopy, modern design, range hood cfm, stainless steel range hood on April 6, 2018 by Mila Hose. We love the look of this wall-mounted Cavaliere 30-inch range hood. It’s made from high quality stainless steel featuring a brushed finish, and the baffle filter is dishwasher safe making clean up a breeze! Right now, the this CAV-X06 30″ wall mount range hood is on sale! Buy it now and save $530.99, plus shipping is free! Wondering what centrifugal blowers are all about? Get the answers here. This entry was posted in Cleaning the Kitchen, Kitchen Design, Kitchen Tech, Wall Mount Range Hoods and tagged blowers, buy, sale, stainless steel range hood on February 19, 2018 by Mila Hose. Stainless steel remains a popular choice for kitchen appliances, including the range hoods because it’s easy to care for. It’s modern, and it’s clean and bright. We carry many stainless steel range hoods that come in a variety of shapes, sizes and styles. It’s really important to note that not all stainless steel is equal. Some stainless steel will rust. In a kitchen environment where you create steam through the act of cooking, the last thing you want to deal with is a range hood that corrodes and needs to be replaced after a short time. Our range hoods are made with 19 gauge stainless steel, and that’s key. That level of quality steel will never rust. It will remain looking as new as the day you bought it. Better quality stainless steel is also really easy to clean! And for such a key component of the kitchen, you really want to make sure you invest in a high quality range hood. Give our Support Team a call if you have any other questions. We’re happy to help you out! This entry was posted in Home Improvement, Kitchen Design, Kitchen Tech, Kitchen Tips and tagged clean, modern design, stainless steel range hood, style on August 25, 2017 by Mila Hose. If you walk down the aisles of any home improvement store, you’re bound to see row upon row of range hoods. At one time, most homes did not come equipped with a range hood over the stove. If whatever you were cooking produced a lot of smoke or odor, you opened the windows. If whatever you were cooking produced a lot of grease … well, you could look forward to a night of scrubbing down the kitchen. The fact that range hoods are pretty common additions to modern kitchens is a boon to everyone who likes to cook, but not clean … and vice versa, too. So, back to that aisle of range hoods in practically every home hardware. You’ll notice that the majority of them are stainless steel. There is absolutely nothing wrong with stainless steel. It’s easy to clean, won’t corrode, and looks great in any kitchen design. But, have you ever thought of buying a range hood made from copper? Copper makes a beautiful addition to any kitchen design – traditional or modern. You also have the option of allowing copper to change over time or keeping it the same. If a protective glaze is applied to copper, it will retain that warm, orangey look forever. If no protective glaze is applied, then the copper will acquire a patina over time. That’s when that warm, copper brown turns to a kind of blue-green. The patina effect is as sought after as new copper. So, don’t think of it as a disadvantage. It just comes down to your own personal taste. Copper is just as flexible as stainless steel in terms of its design capabilities. It can be mixed with other materials (as in a range hood that features a copper chimney and a glass hood, or one that features a stainless steel chimney and a copper hood). Copper is also as strong as stainless steel and guaranteed to last a lifetime. Over to you: Which range hood material do you like best? This entry was posted in Cleaning the Kitchen, Cooking, Cooking with Range Hoods, Home Improvement, Kitchen Design, Range Hoods and tagged copper range hood, kitchen design, modern kitchens, stainless steel range hood, traditional kitchens on August 10, 2016 by Mila Hose. Who would have ever thought that the stainless steel range hood trend would last this long. I’m not sure exactly how long. But, I am pretty sure it’s been going strong for at least ten years. I’m also pretty sure it’s not slowing down. There are a lot of advantages to stainless steel appliances in general. Design changes are coming, though. Manufacturers like KitchenAid aren’t ignoring the love we have for our stainless steel appliances. Instead, they’re trying to improve upon it. You’ll find range hoods, for instance, that integrate a variety of materials, like stainless steel and glass or stainless steel and wood. The latest addition to this materials mix is actually black stainless steel. The appliance, itself, is made out of stainless steel. But then, a black, protective, coating is laid over top. The coating really does give it a matte, black steel look. It has all the advantages of stainless steel, and a new, sleek, clean and professional look. This entry was posted in Home Improvement, Kitchen Design, Range Hoods and tagged black stainless steel, stainless steel, stainless steel range hood on August 4, 2016 by Mila Hose. Right now, during the warm summer months, you’re probably thinking about every way you can keep your kitchen cool. However, you may also want to consider how to update your kitchen before winter arrives. The summer season is an excellent time to gear up for winter and get your home ready for those chilly days before they happen. It’s also a convenient time for home improvement projects in the kitchen, because you can still grill outside temporarily if you cannot use your kitchen appliances. Cook your food outdoors in the fresh air, so you don’t have to worry about having to cook all of your meals in the microwave or the toaster oven. This is especially helpful if you are feeding multiple members of your family at once. Heating Flooring – Heated flooring can be installed underneath any type of flooring in the home. Heated flooring is a perfect addition before the winter months so you can walk around in your kitchen and feel less cold. Be more comfortable in your kitchen next winter with a new heated flooring system. Update the Backsplash – Take the time this summer to improve your kitchen backsplash. 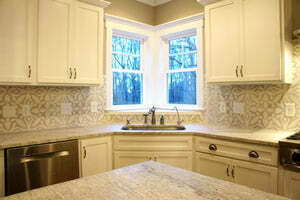 Tile Talks recently published Tile Tips for an Eye-Catching Backsplash. You can reference their post for more ideas for tile designs and updating your backsplash. Go Bigger – Do some construction to create a bigger kitchen for you and your family. One of the biggest complaints homeowners and renters have about their kitchens is the lack of space. More space will provide additional storage, workspace and space for family to sit and eat together. Add a Range Hood – Do you have proper indoor air ventilation in your kitchen? If not, you can purchase a kitchen range hood to install during your summer home remodeling projects. The range hood will ventilate grease, smoke, odors and heat from the kitchen to make cooking more convenient and cleaner. -A fireplace near the kitchen to keep people warm and comfortable while they are eating together. -Purchase and install a larger freezer to store food in before winter hits. Buying and freezing food in bulk also helps save money on groceries. -Install a pot rack in your kitchen. You can store pots and pans on it and free up space in your kitchen cabinets. -Repaint your kitchen before the holidays and impress your friends and family with the fresh coat of paint on the walls. -Replace any large kitchen appliances that may need updating while you are already making improvements and cooking outside. If you’d like to improve your kitchen before winter comes, feel free to call Range Hoods Inc at 1-800-914-9775. We are available seven days a week to discuss stainless steel kitchen range hood sand your home improvement needs. This entry was posted in Home Improvement, Indoor Air Pollution, Kitchen Design, Kitchen Tech, Kitchen Tips, Range Hoods and tagged Avente Tile, backsplash, heated flooring, home appliance, home improvement, kitchen, range hood, range hoods inc, stainless steel range hood, Tile Talk on July 29, 2015 by editor.